Premium polka dot nylon tulle is a easily worked with fabric and its strong, capable of handling easy quality makes you to spend only little effort to do your innovative craft works. Available in all exciting colors and shades. 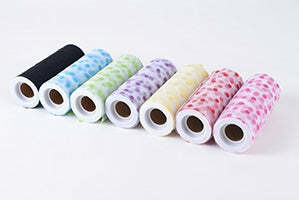 This fabric roll is used in wedding decorations, the nylon glittering soft touch, adds beautiful look to party backdrops and wardrobe decorations. Our nylon tulle comes in wholesale order with affordable price. Wholesale customers ought to log in to your account to look at valuation and place order cloth.